Maja Salvador we loved as Lily Cruz is falling into a Thai superstar Tor Saksit. 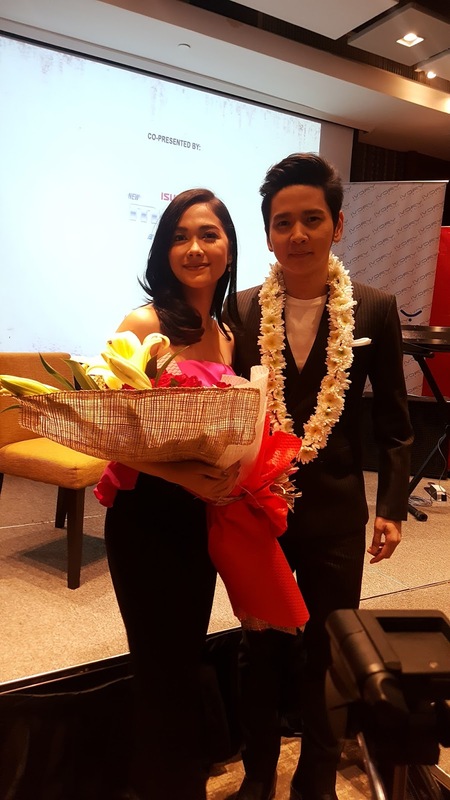 Ivory Music and Video Philippines and BECTero Music Thailand released Maja Salvador and Thai Superstar Tor Saksit's music video of a phenomenal song "Falling Into You" at Marco Polo Hotel Ortigas yesterday. Maja recorded the song and the music video with Tor Saksit who co-wrote the song in Bangkok Thailand last year and shared how they first met each other via video call. Tor adored Maja always adventurous and hungry and Maja adored Tor for his passion and talent in piano and songwriting. The two make a great team that led the media laughing. The song was co-presented by The Tourism Authority of Thailand and Isuzu MuX Blue Power, supported ny Marco Polo Hotel, Megaworld Lifestyle Malls and Robinsons now available on iTunes, Apple Music, Spotify, Deezer and Amazon.